While the most obvious difference between the Arctic and the Antarctic is their geographical location, there are many more reasons the two are on opposite sides of the globe. The Arctic, also known as the North Pole, is the Northern-most part of the world. The Antarctic is the South Pole and is the Southern-most part of the world. These two areas are considered the coldest climates on the planet and are virtually inhabitable except to the animals and indigenous cultures who have become accustomed to the cold. In the Arctic, precipitation is year round snowfall and the only area of the Antarctic which receives this kind of precipitation is on the outer edges of Antarctica. Temperatures in both the Arctic and Antarctic are regularly below 0 °F, and the lowest temperature recorded was -128°F in Antarctica. Geographically, there is no Arctic continent, but rather, large pieces of ice which have formed over the water. The Antarctic is a continent, however it is also covered in ice. The size of the Antarctic is also nearly 3 million km² bigger than the Arctic. The Arctic and Antarctic is home to many different species. In the Arctic there are caribou, beluga whales, and polar bears. 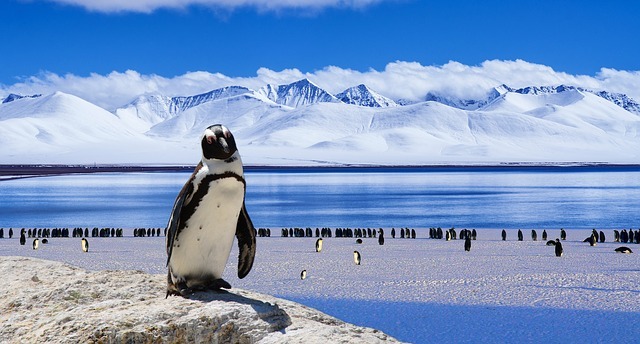 The Antarctic is home to orcas, penguins, and seals. Polar bears can only be found in the Arctic, penguins can only be found in the Antarctic, all other animals are typically found in both places. The Antarctic is home to the fifth-largest continent Antarctica. The Arctic is made up of portions of Greenland, Russia, Canada, Norway, Sweden, Finland, Iceland, and the United States. In the Antarctic there are no permanent residents, though there are anywhere from 1000 to 5000 scientists who are there to conduct research. The Arctic spreads across many continents and between them all there are nearly 4 million permanent residents. While both areas may seem different they both face the same problem of global warming. Ozone depletion has led to melting ice caps in both the Arctic and the Antarctic, and the problem is worsening every day. Global warming has threatened the cold climate in the poles, the animals that live there, in addition to creating a rise in ocean footage across the globe. Since the Arctic and Antarctic regions are on opposite sides of the world there are understandable differences between the two, however both still seem to be affected similarly by global warming. The Arctic is the northern-most region on Earth. The Antarctic is the southern-most region. Both have sub-arctic climates. There are various animal species indigenous to both. Polar bears can be found in the Arctic and penguins can be found in the Antarctic. The Antarctic is home to one entire continent, while the Arctic is made up of parts of eight different countries. The temperatures in the Arctic and Antarctica are consistently below freezing. The lowest temperature on record was taken from Antarctica in the winter. Global warming is affecting both the Arctic and the Antarctic in many ways. Prabhat S. "Difference Between Arctic and Antarctic." DifferenceBetween.net. December 9, 2015 < http://www.differencebetween.net/science/nature/difference-between-arctic-and-antarctic/ >. What does – Â – mean?